It’s all in a day’s work for us. Warning: your neighbors may be jealous. We provide professional mowing services, mulch, weed control, tree and shrubbery trimming, as well as fall clean up. Let us do the hard work and give you the professional results that will make you proud of your property. New Outlook really gets creative when it comes to hardscaping your yard. We will sit down with you, get your ideas, and create a custom professional design to show you the potential of your property. We use a combination of pathway lights, spot lights, and accent lights to provide both a safe and well lit property as well as a beautiful transformative view of your house and landscape at night. Want to make your neighbors green with envy? Our fertilizing and turf management programs will give you the greenest yard in the neighborhood. When it comes to water features we have several options to choose from and every job is unique and customized to your landscape. New Outlook provides consistent on time service to our snow removal clients. We have the equipment and manpower to keep your property clear and ensure you are open for business on time! Welcome your guests as they walk to your front door on your new beautiful custom stone walkway, or have us install one of these beautiful accents for your garden, pool or outdoor living area. Nothing says luxury and relaxation like a beautiful outdoor patio installed by New Outlook Landscaping. We are the patio installation experts and look forward to helping with all of your outdoor living projects. 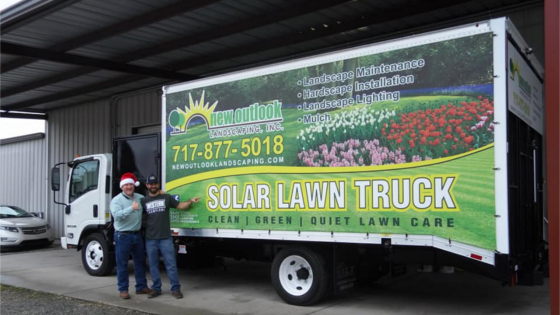 Home of the Solar Lawn Truck! We are professionals and we hire professionals. We are about building relationships. We will be there when we say and do what we promised. We answer the phone or call you back within 24 hours. We correct any part of our work that you are not happy with. “I have used New Outlook Landscaping for many of our properties. They always show up when they say they will. The work is done with quality and the final bill is exactly what they told me up front it would be.” Rocky L.
“The owner is a great local guy, who will take care of your property!” Michael S.
“New Outlook Landscaping is great. Luke is wonderful. They will not disappoint you.” Patsy K.
“If you’re looking for a company that pays attention to the small details, New Outlook Landscaping is the company for you. Going above and beyond to make sure their customers are happy with the finished project is a strong point of this group. ” Tammi H.